Discussion in 'Guild section' started by Pilgrim, Jan 26, 2016. 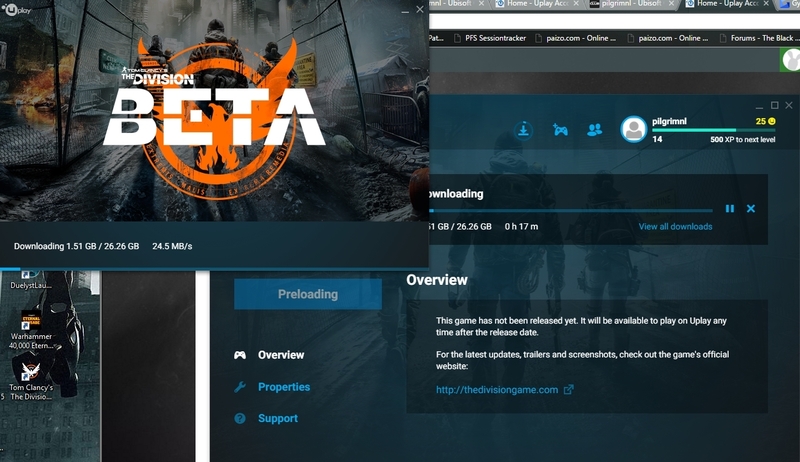 In uplay you can check for your beta status. I just got the invites! i see it on my account, but its not there in my launcher. And the hype is real! Servers will open up on friday at 1pm CET for us EU ppl! Cool, can spend some quality time with the missus and then game the rest of the day! Edit: Anyone up for playing at bit at the 1PM CET? I am, just gotta see if it runs. And I have nothing in my account yet. If we get 2x 3grps we can go into the DZ and just scare people away (if we all get in the same instance ) But yeah, planning on streaming, making some vids and recording it as well! I didn't get the email until last night. Shortly before I got the email, the client became downloadable in the uplay launcher. anyone able to post a new discord link please, tried some of the older post links and just says the links expired.